When you think of old world pizza, you likely picture it coming out of a beautifully Tuscan crafted brick oven. But Kalamazoo Outdoor Gourmet™, the leading manufacturer of high-end outdoor kitchen equipment, has mastered the modern day convenience and old world cooked taste with their Artisan Fire Pizza Oven. The first countertop outdoor pizza oven with two independently-controlled burners, offering unparalleled cooking power and control. Kalamazoo has taken all of the best features and cooking characteristics found in traditional brick-lined, large, wood-fired pizza ovens and wrapped them in an elegant gas-fired stainless steel package. 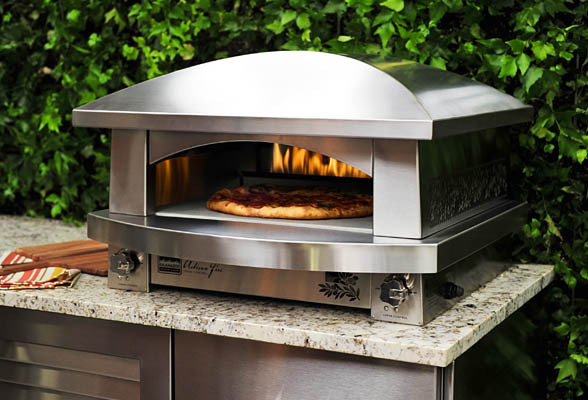 With a top temperature in excess of 800 degrees, its two custom-made and independently-controlled burners give outdoor cooks the ability to customize the oven’s heat and bake any style of pizza, calzones and artisanal breads. One burner warms the bottom baking stone, cooking the crust, while the second heats the oven’s interior and browns pizza toppings. The oven comes up to baking temperature in as little as 20 minutes, making pizza night a more spontaneous occasion. Neapolitan-style pizzas cook in as little as two minutes. The oven’s newly-designed open front gives cooks the ability to view the flames dancing at the back of the oven and watch the pizza as it bakes so it can be removed from the oven at just the right moment. 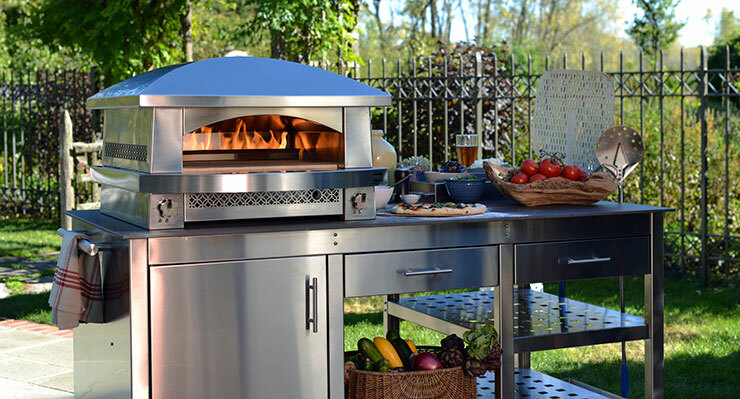 The Artisan Fire Pizza Oven’s compact size leaves a small footprint on a countertop, making it an ideal element for a new outdoor kitchen while its ability to connect to standard 20-pound LP gas bottles or natural gas lines makes it easy to add to preexisting outdoor kitchens, patios or balconies.